Welcome to our site on the burning of Irish Ascendency Houses (or Big Houses). We are focusing on two Big Houses: Mitchelstown Castle and the fictional Danielstown. Throughout the semester we have been learning about Irish landscape and history and we have decided to focus specifically on how our individual big houses can be seen as a microcosm of the changing Irish landscape leading to the decline of the Ascendancy. I am Nick Widman and I came up with my individual project after taking many suggestions from the professors and realizing that if I focused on one house in Ireland I could use it as a representation of the whole of Ireland. I chose Mitchelstown castle because it was the biggest big house of them all and later I realized that the castle had a surprisingly ridiculous history of tension and instability as well. This worked together greatly with the idea of tying one big house to Ireland as Ireland had a far from mundane history which could be tied well with the exploits of Mitchelstown Castle. Our project came together through realizing that our individual projects could be focused on the idea of a crumbling Ascendency hold on Ireland due to the Ascendency’s own actions. I’m Hannah Fuller and I chose to write my individual project on the burning of big houses with a more narrowed look into The Last September by Elizabeth Bowen. I felt that the novel’s portrayal of how the Ascendency handled the potential threat of the decline of their power was very interesting, and as I did further research (along with suggestions from my professors) that this fear was based on a feeling of liminality. This sense of in-between-ness can be seen not only through the characters in the novel, but was the reality for many Anglo-Irish. [Main Focus]- Here we draw connections about the underlying themes of our separate projects, pulling threads from our individual topics and tying them together to form one cohesive project about the fragility and liminality of the Ascendency that would lead to their decline. [Mitchelstown Castle]- Mitchelstown Castle was infamous for its massive size, but the real focus should be put on its various owners who ultimately contributed to their own downfall. 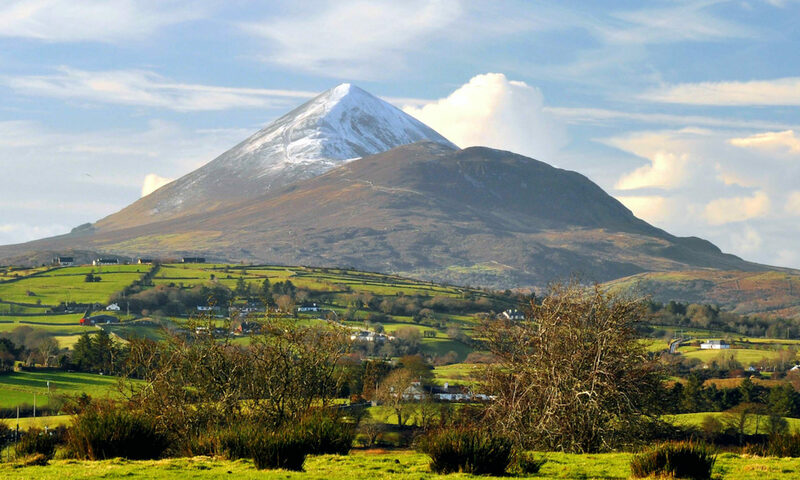 The owners felt the need to dominate the Irish landscape due to their liminality. The castle therefore stands as a symbol of the Irish Ascendency and their overconfidence that would be their demise. [Bowens Court]- Elizabeth Bowen spent some of her time in Cork, Ireland, in the Big House, Bowens Court. While this home was never actually burned, it was abandoned and later torn down. Bowen herself felt an immense sense of liminality that would serve as inspiration for her novel, The Last September. [Danielstown]- Author Elizabeth Bowen writes of a fictional town named Danielstown, the site of the Naylors Ascendency home, in her novel The Last September. Although fictional, this Big House represents the fears many land owners had about the decline of the Ascendency lifestyle and was the site of one of the many burnings during this time. Due to the character’s inaction, and an already crumbling Ascendency, the house was burnt down and served as a reminder that this sense of liminality had no place in Ireland. 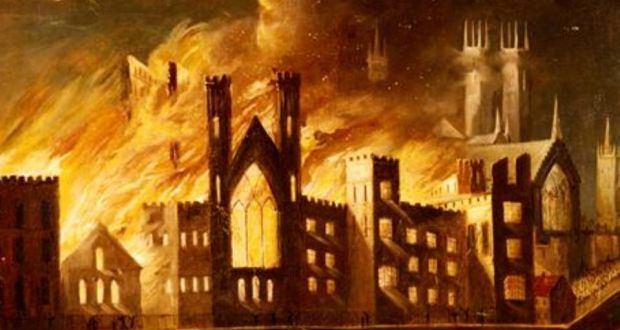 [Burning and Destruction]- The burning and eventual destruction of Mitchelstown Castle and the fictional Danielstown home symbolized the end to centuries of power, torment, and isolation of the Ascendency from the rest of Ireland. The use of fire physically cleansed the landscape of these homes but the real destruction took place by the hands of the owners.